If you own a video game console, there are only two choices for racing simulations. Playstation people have to play Gran Turismo and XBOX loyalists are all over the Forza Motorsport series. While both games have a great driving experience, you're restricted to driving only on the race track. 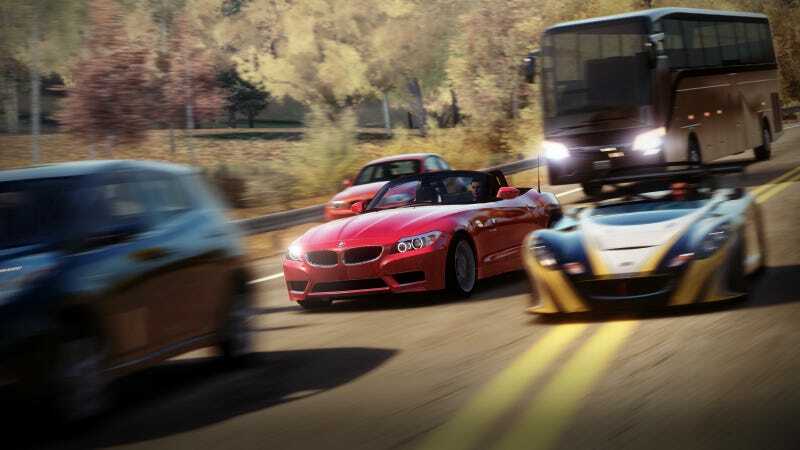 With Forza Horizon, the race track has morphed into hundreds of miles of open roads to explore and race on. But does losing the track keep the Forza magic? We recently got a sneak peak at the game to find out. With Forza Horizon, Turn 10 is trying to get back to the roots of the franchise. Dan Greenawalt, the Creative Director at Turn 10 Studios, told us that "Forza goes towards a certain vision: It's not about simulation, it's about turning car lovers into gamers and gamers into car lovers." But until today, Forza has only been in a motorsport arena, and a lot of players just aren't interested in cutting down their lap times. They just want to drive. In Horizon, the race track is eschewed, and instead it's replaced by a semi-fictionalized version of Colorado. The best roads and scenery made the cut, the boring stuff didn't. And it's all centralized around the Horizon Festival, which is a combination summer music and racing festival. The festival is also where your garage, car dealers, and upgrade shops are located. While the car models are different from Forza 4, the highly acclaimed physics engine has made the transition. I'm a Gran Turismo addict, and I have to say I was very impressed. It was easy to pick up and play for a novice, but when you turn off the driver aids, it gets progressively harder without becoming impossible, which is refreshing. Gran Turismo can barely be considered a "pick up and play" type of game. To be fast on the tracks takes a lot of time and effort. Even with aids on, Gran Turismo is far from being an easy game. I immediately felt at home in Forza Horizon. The handling models of the cars are predictable and easy to control. But that's not to say the game is "easy." The events I had the chance to run were very challenging and the cars could be a handful, especially with the aids off. But it just didn't feel impossible like GT5 often does. For the first time playing it, it inspired confidence in my own abilities and I repeatedly turned off aids and turned up the difficulty. Instead of knocking you down like Gran Turismo, Forza gains your trust and builds you up. The graphics are also astounding. The car models look photo realistic, but run into a few things and damage makes them look pretty sad. There is no mechanical damage to speak of. The Forza team didn't confirm the car count to us, but did say there will be tons. There were also be a variety of off-road and on-road cars, as well as less of a focus on race cars and more on road cars. They also said that DLC for Forza 4 is not compatible with the cars in the game, due to changes with lighting and other elements of the game. Lighting is beautiful during the day, but the whole landscape really comes alive at night. Like a real music festival, the in-game Horizon Festival you're supposed to be a part of has fireworks and tons of cool lighting. Unlike Gran Turismo 5, which has a dark night that makes it impossible to see anything, Forza uses a large, bright moon and reflections to make a night setting that looks real but also doesn't make you crash into things like Mr. Magoo. As for the game itself, in my hour of gameplay I went from tenderfoot in a Volkswagen Corrado to a semi-bigshot with a Mustang Boss 302 and an Evo X in the garage. Events reward you with money and prizes, but you knew that if you've ever touched a video game before. The events are also rather unique. One event pitted me in a Boss 302 against a P51 Mustang. Win the race, win the car, it's that simple. And if you don't want to race, just drive and explore. But watch out, there is traffic that you can crash into. There are more than 200 roads in the game, making up tons of mileage; The exact number wasn't revealed to us. And if you hoon about, you earn points which ups your rank in the game and gets you exclusive invites to more challenging race events. I did not get to sample the game on XBOX Live, but the streets of Colorado will become an open lobby where you can drift, drive, and challenge others to a street race. People can show off the mods to their cars and generally drive like maniacs, which they can't do on the street... legally. We'll be testing the game more thoroughly closer to the October release date, but this little taste has made us want more.